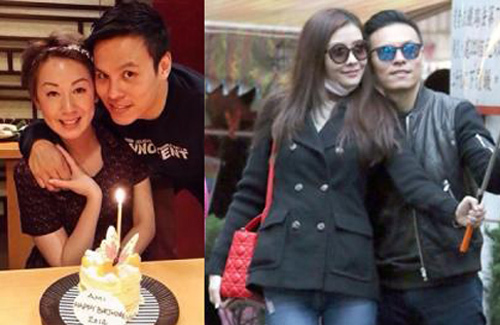 Recently engaged with Kenix Kwok‘s (郭可盈) younger brother Ken Kwok (郭可頌), Lynn Hung (熊黛林) is looking forward to becoming a December bride.With a net worth of $100 million HKD, Ken treats his women well. He has showered Lynn with a $800,000 HKD luxury car and $10 million HKD apartment in their one-year dating period. An especially generous man, Ken also left some real estate assets under his ex-wife’s name, leading to gossip over their tangled past. Like many other wealthy men, Ken has a complicated romantic past. He divorced his wife Ami in 2013 but continued to remain in close contact with her, even as he began dating Lynn. In 2014, for instance, Ken attended Ami’s birthday celebration and at the end of that year, went on a romantic holiday with Lynn to Taiwan. Furthermore, a luxury property that was jointly owned by Ken and Ami during their marriage continues to remain under their joint names even today. What complicates the situation further is that Ami does not appear to have moved on. On Ami’s Facebook profile, she displays couple photographs of her and Ken from their first year of marriage to 2014 after their divorce. These photographs remained even after Lynn’s recent announcement on her engagement to Ken. When contacted for a response, Ken initially said, “I haven’t noticed…I don’t really use Facebook much.” An hour later, Ken approached the reporter and explained that Ami had merely failed to delete those photographs. after breaking up with aaron kwok, lynn hung has landed with another rich guy. A younger, taller and richer guy at that. Some people always have the wind behind their back. haha lol….Exactly, always kind of knew Kenix Kwok came with money but actually quite $$$$$$$ huh? Wow…. Materialistic girl has picked right and good timing as well it seems. Not complicated if they knew their respective roles and the lines between them. Just shows this man doesn’t trash his ex wife or ignore his own responsibilities. Could be a good thing. Yes, agree. Wisdom in those comments. It reveals basic decency and responsibility, and maturity – ie mature enough to not be viciously petty (as some men can be in breakups). While some girls celebrate guys who are mean to their exs (or not close or always complaining about his mother) … what current gfs do NOT realize is that same cruelty and callousness can be turned towards them when the going gets rough. As for Lynn … it’s not just lurrve. This girl knows just who to target as her relationship partners. As for Lynn … this girl ain’t just blinded by luuurve when choosing her partners. She seems to know just who to target as her relationship partners and what her priorities are. Thought kenix objected to her brother’s relationship with Lynn? Quite a drastic change with the engagement.